We had to drive to some place near Paris and the Charles de Gaulle airport, so we would be relatively close for the last night. 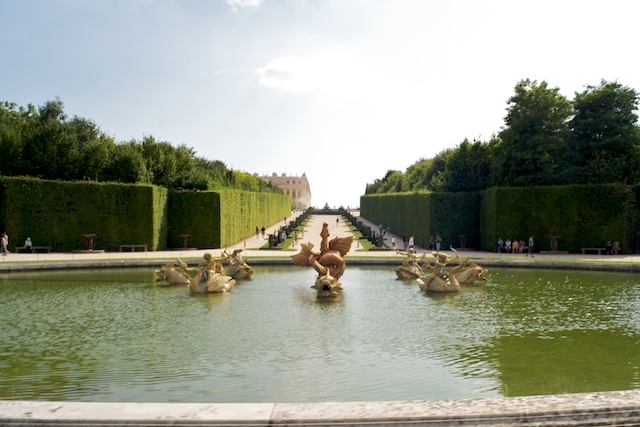 We decided that it would be fun to re-visit Versailles, which is only a short distance from Paris. We didn't want to stay in Paris itself, since neither of us wanted to drive, or find parking, or search for a hotel in the big city, even though we love Paris and will normally miss no opportunity to visit. Also, it felt very appropriate to end our vacation at a palace, since we had started it in the Czar's winter palace in St. Petersburg. 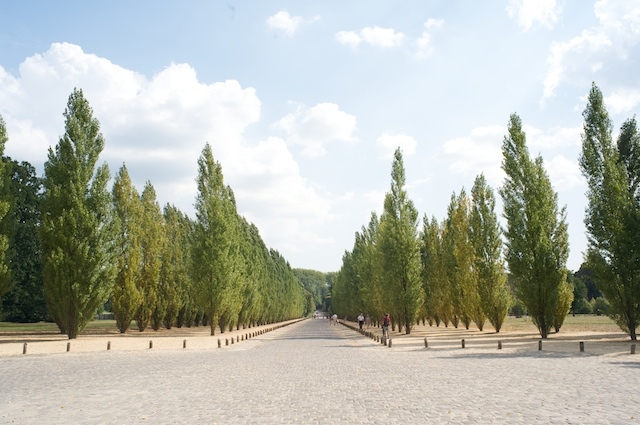 We drove to Versailles, arriving early afternoon. This time we found the tourist information office easily, and were given excellent advice by the young lady inside, who gave us a booklet listing hotels. We asked if she could call to find out if rooms were available, and she did. The hotel we found was directly opposite the entrance to the Palace, literally only a few steps from the entrance gate. Not only that, but it was very reasonably priced, and had free Wifi! We drove from the tourist information office a few blocks to the hotel, and luckily found a parking spot on the street, right in front of the hotel lobby. The desk clerk, who spoke perfect English, told us that the parking on the street was safe, and free for the month of August. 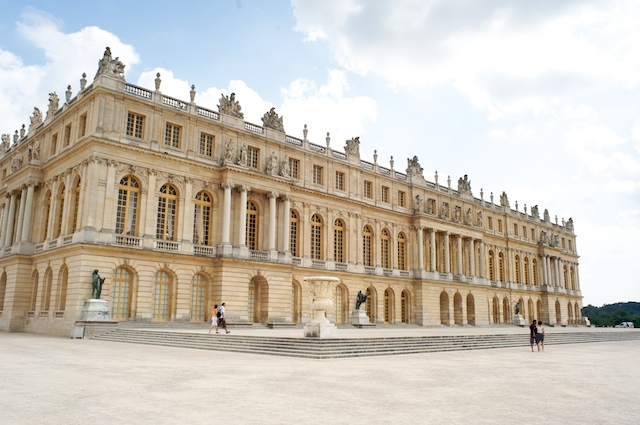 After checking in, we of course decided to visit the Palace of Versailles, even though we had both been there before, both separately and together. We walked across the street to the entrance gate, and were surprised by the lack of crowds and tour buses. We went inside the gate, looking for the ticket office, but became confused because the door that was marked with flags as the ticket office was closed and nobody was waiting to get tickets. 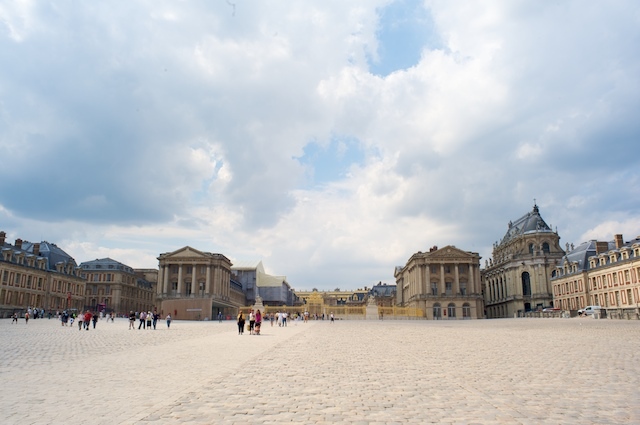 We walked further toward the palace, and followed some people toward the gardens, continuing to look for a ticket booth. At the entrance to the huge Versailles gardens, there were ticket booths, but they were closed also, and we walked into the gardens without needing tickets. Finally, we overheard somebody say that the Palace was closed Mondays and the gardens were free that day. Today was Monday! We decided that visiting the gardens of Versailles was still a worthwhile way to finish our vacation, so we started walking around the gardens. Shortly, we came to a little booth, next to which were parked a couple of electric golf-carts. People were lined up at the booth. I went and looked at the sign, and found out that you could rent a golf-cart to drive around the gardens of Versailles! Donnie and I looked at each other, and we said "Wow, what fun!". But, Donnie had left her driver's license in the hotel, and I didn't have one, so we shrugged and kept walking. It would have been a blast though. We then came on one of those little trains and rode around the gardens for about 40 minutes. The gardens were somewhat of a disappointment, however, and when I mentioned it later, Donnie remembered that they had been severely damaged a few years ago in a storm, and obviously had not been restored. While we were sitting in the little train, we saw something very unusual. There was a man on a strange bicycle-like contraption, slowly pedaling around the gardens. We looked more closely and realized what it was... The GoogleCam! 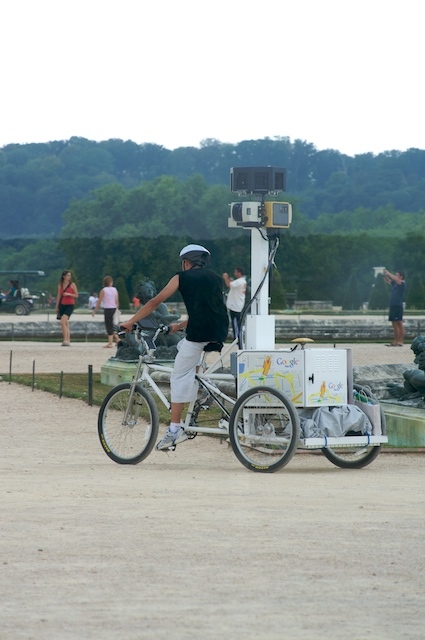 Google was taking pictures of the Gardens of Versailles, presumably for Google Street View, or Google Earth, and since there were many places in the gardens that you couldn't drive a car, they were using a bicycle! By this time it was late afternoon, so we walked past the Palace, back to our hotel, taking a few pictures of the fancy gold-leaf work on the gates, which we were pretty sure was newly restored since our last visits. We rested a while in the hotel, and decided to go downstairs to the little restaurant in the hotel for dinner. So we walked for a few blocks to the market area. The streets were pretty deserted until we got there, and then when we got to the market area, there were lots of people sitting at outdoor tables, having dinner. The market was closed of course, but around the outside of the market itself was a ring of permanent market stall buildings, closed now, and outside them were a number of restaurants. We decided to walk all the way around and look at the menus and then decide. We ran into the usual problem; we couldn't decipher most of the menus. Either they used French words for types of fish or meat that we didn't know, or worse, they used styles or names that were purely local, like Blah-Blah a la so-and-so. Donnie really liked the look of the place that the desk clerk had mentioned, and it had a good crowd of people, so we decided to try it. We sat at a little outdoor table and the waiter brought the menus. I couldn't find anything on the menu! I found several things I knew I didn't like (I don't like lamb), and a few that I hadn't any idea what they were. When the waiter came, we asked him if he spoke English, and he said just a little bit. We got up the nerve, and asked him if he could explain a couple of the menu items. I asked about "Pave de Biche". He looked puzzled, thought for a while trying to come up with the name in English, and then leaned over close to my ear, obviously embarrassed, and whispered "Bambi"; venison, obviously. I was delighted. Something I could eat. I ordered the venison, flamed in a cognac sauce, with mushrooms and on the side was one of my favorite French dishes: "Gratinee Dauphinoise", which is a casserole of sliced potatoes in a cream, and cheese, and butter sauce. Donnie ordered some duck. For appetizers, I had melon in Port wine, which was very fresh and sweet and refreshing, and Donnie had a "Mille Feuille de Tomate aux Chevre frais", which is a salad consisting of thin slices of very, very fresh tomatoes interspersed with slices of fresh goat cheese, which Donnie loves. I will skip any more description of the meal, except to say that it was the best meal we had on the trip! (Ok, one more description. For dessert, I had a really good chocolate mousse). After a fantastic dinner, we walked happily back to the lovely hotel next to the Palais de Versailles, met the desk clerk and thanked him profusely for his recommendation, and went to bed, having had a really wonderful last evening in France. The next morning, we checked out of the hotel, noticing that there was a huge number of tour buses in the parking lot of the palace. We drove to the Charles de Gaulle airport, returned the rental car, and did all the usual airport things, including having a terrible, overpriced lunch in the airport "food court". We got on our plane, and took the sad, but uneventful flight home to Yorktown Heights, New York. The trip was wonderful. The sights were beautiful and amazing. St. Petersburg exceeded all our expectations, as did the Netherlands and Brittany. The weather was almost perfect, which is very unusual for one of our trips. In all, a fantastic vacation that we won't forget. Donnie, as usual, is already planning our next trip. Did I just hear her muttering "Mongolia"?